Defender Phil Jones believes the mood at Manchester United is not as bad as it was during David Moyes' ill-fated reign as manager at Old Trafford. 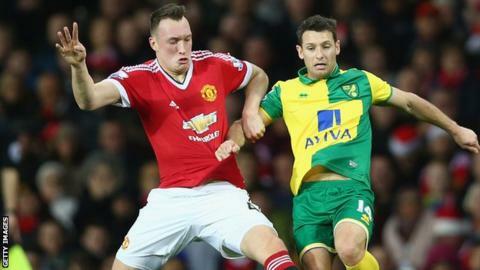 Saturday's 2-1 defeat by Norwich was United's third in a row and saw them slip to fifth in the Premier League. Moyes was sacked in April 2014 after nine months at the club, as they headed for a seventh-place league finish. "I wouldn't say it's the lowest moment," said Jones, 23. "I think it became pretty glum under David Moyes." United's league finish in 2014 was their lowest since 1990, and it was the first time they had ended the season outside England's top three since 1991. But under Louis van Gaal, who replaced Moyes, they are winless in their past six games, a sequence that has included their elimination from the Champions League at the group stage. Van Gaal's side were booed off the pitch at Old Trafford following the Norwich defeat and the Dutchman has admitted he is "worried" about his job. But Jones has backed the former Netherlands coach and said the players need to take responsibility for improving form. "The manager is doing all he can and is doing a terrific job," said the England international. "It's not even questionable in the dressing room. The lads are absolutely fully focused on performing well for the manager, the fans, ourselves - week in, week out. "The players in there aren't hiding behind anyone."